Nevada sports books won only 0.7 percent of the Super Bowl LII handle for $1.17 million to narrowly avoid losing money on the Super Bowl for the third time in 28 years. 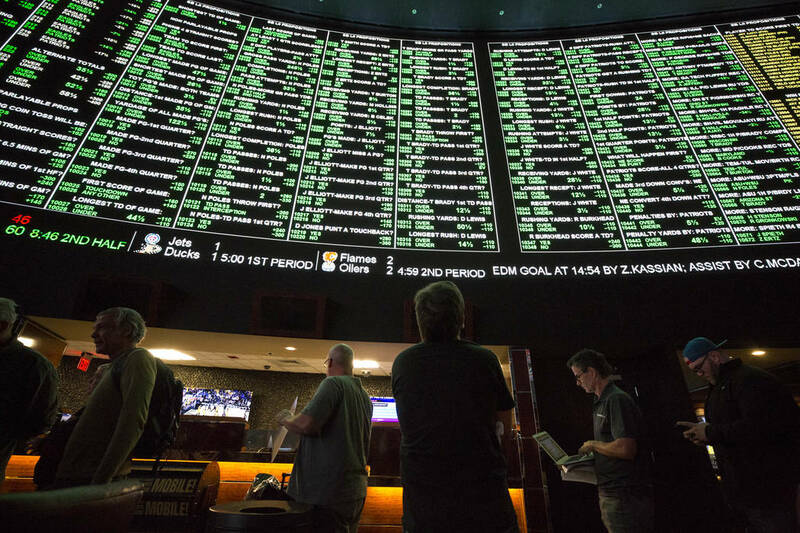 A game that rewrote Super Bowl records for offense also shattered Nevada’s record for betting handle. But the state’s sports books finished with their lowest win percentage in 10 years. Nevada’s 198 sports books had $158.6 million wagered on the Philadelphia Eagles’ 41-33 upset of the New England Patriots on Sunday, according to figures released Monday by the Nevada Gaming Control Board. The books won only 0.7 percent of the handle for $1.17 million to narrowly avoid losing money on the Super Bowl for the third time in 28 years. The only two Super Bowls the books have lost since the state started tracking the game in 1991 were the Giants’ 17-14 upset of the Patriots in 2008 and the 49ers’ 49-26 blowout of the Chargers in 1995. The win percentage was the lowest since 2011, when the books won 0.8 percent ($724,000) of the $87.5 million handle on the Packers’ 31-25 win over the Steelers. Sunday’s game produced an NFL-record 1,151 yards and generated the state’s third straight record handle. Last year’s game produced $138.5 million in wagers and the 2016 contest generated $132.5 million in bets. The prevalance of mobile apps and growth of in-progress wagering also have helped increase the handle. There were five $1 million wagers reported on the game, with only one on the Patriots, who closed as 4- to 5-point favorites. Four of them were placed at William Hill sports book, which took a multimillion-dollar loss. The books’ win on the game took a huge hit from one high roller. The same mystery bettor who beat Las Vegas books out of an estimated $10 million on the World Series reportedly won more than $10 million on the Super Bowl. He had a total of at least $7.4 million in money-line wagers on Philadelphia, which closed at plus-170. The mystery man — who’s been called Bettor X and jokingly referred to as Biff Tannen and Nick Papagiorgio on social media — reportedly placed a $3 million wager at MGM Resorts, two separate $1 million bets at William Hill, a total of $1.2 million at CG Technology, a total of $700,000 at South Point and a $500,000 wager at Wynn Las Vegas. “He’s on an unbelievable run,” Holt said. The Patriots trailed 29-19 in the third quarter before rallying to take a 33-32 lead on Tom Brady’s 4-yard touchdown pass to Rob Gronkowski with 9:22 left. But New England’s defense couldn’t stop the Eagles as Nick Foles hit Zach Ertz for the decisive 11-yard touchdown pass with 2:21 left. With the betting public cashing most player props in the shootout, bookmakers weren’t exactly celebrating the record handle. In Super Bowl XLII, the books lost $2.5 million (negative hold of 2.8 percent) when New York spoiled New England’s bid for a 19-0 season as 12-point underdogs. In Super Bowl XXIX, the books lost $396,674 (negative hold of 0.6 percent) when San Francisco covered as an 18½-point favorite. The books won more than $10 million on three of the last five Super Bowls, winning a record $19.7 million (16.5 percent) in Seattle’s 43-8 upset of Denver in 2014.